KINGSTOWN, St. Vincent, Mar 30 2017 (IPS) - In the 1980s, an institution for troubled Danish youth and a vocational school for Vincentians was built in Richmond Vale, an agricultural district on the northwestern tip of St. Vincent. It was hoped that spending time at Richmond Vale Academy would help the Danish youth to see the world from a different perspective. However, for a number of reasons, the concept didn’t pan out, the school closed and a farm was developed in its place. In 2000, the first attempts were made to re-start the academy, which has been in full operation since 2007. Today, Richmond Vale Academy attracts young people from around the world who are troubled by poverty and what is going on with the Earth’s climate and want to do something about it. The not-for-profit institution had previously focused mainly on poverty alleviation, with an emphasis on service in Africa. However, in 2010, Hurricane Tomas — the latest recorded tropical cyclone on a calendar year to strike the Windward Islands — passed to the north of St. Vincent, where the academy is located, and St. Lucia. The storm, which impacted St. Vincent on Oct. 30, left hundreds of homes without roofs, and, in addition to significant damage to homes and public infrastructure, destroyed about 90 per cent of banana cultivation, then an important crop for the local economy. The academy’s banana cultivation, which had taken three years to get to the point where it met the standards necessary for exportation to England, was also ruined. “Three years of work was destroyed in seven hours,” Herberg said of the impact on the academy, adding, “but for other farmers, it was their lifetime’s work. The research led to the St. Vincent Climate Compliance Conference 2012-2021, which aims to make St. Vincent and the Grenadines one of the first nations to become “climate compliant”. The programme brings together local students as well as students from Europe, North America, South America, other parts of the Caribbean and Asia for programmes of one, three or six months duration, in which they learn about global warming, its causes and consequences. The programme offers firsthand knowledge, as students can go directly into the nearby communities such as the village of Fitz Hughes or the town of Chateaubelair to see the impact on housing, public infrastructure, and the physical environment of severe weather events resulting from climate change. However, the major focus of the programme is on “climate compliance”, which might be more frequently referred to as adaptation measures. “Because if you going to talk about getting ready for climate change, if you are not doing it yourself, if you are going to tell people ‘I think it is a good idea to go organic. It is good for the soil, to plant trees’ — if you are not doing it for yourself, when you are speaking to other people it will be less effective,” Herberg said. The academy has developed models and used its own farm to demonstrate ways in which the population can move away from carbon-based fossil fuels, which contribute to global warming. For example, the academy set up a bio-gas facility that shows that mixing 1.5 kilogrammes of kitchen waste with 50 litres of water can produce fuel for five hours a day in a country where liquefied petroleum gas (LPG) is the main fuel used for cooking. “It is suitable as a model that can be used by families in villages,” Herberg said of the academy’s biogas facility. “We cannot make hydropower plants, we cannot build geothermal power plants. Governments have a variety of plans for that, so we have to see what can we do. 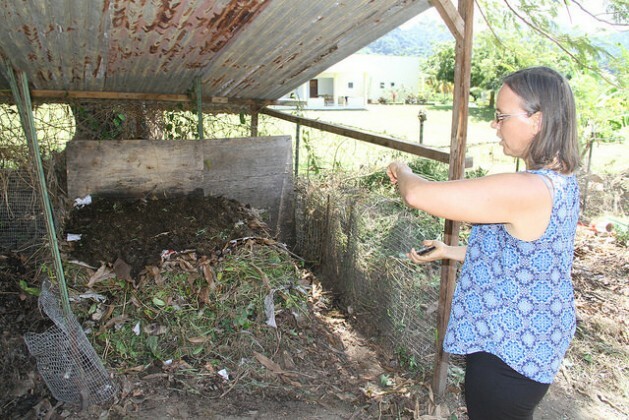 We are promoting solar, and also the biogas,” she said, adding that Richmond Vale Academy has secured funding to set up five biogas facilities in western St. Vincent. The biogas production process results in slurry that can be used as fertilizer. “The important thing is that people know there are alternatives. I don’t think we can get everybody on biogas. I doubt that. But what is important is that we open up and say these are the options,” Herberg explains. While potable water is almost always available on St. Vincent Island, St. Vincent and the Grenadines is a water-stressed country as there are no rivers and no municipal supply of water in the Grenadines, an archipelago. However, even on St. Vincent Island, with its rivers, streams, and springs, the dry season, which runs from December to May, can be especially punishing for farmers, only 7 per cent of whom have irrigation. Richmond Vale Academy has developed a system for collecting rainwater for washing, showers, and toilets. The excess water from this system collects in a reservoir and is used for irrigation. Small fish are placed in the catchment to prevent mosquitos from breeding in it. Further, the academy has, over the years, phased out chemical fertilizers from its farm. In explaining the link between organic farming and mitigating against climate change, Herberg tells IPS that as the climate changes, St. Vincent and the Grenadines is expected to have more periods without rain, and when the rains come, they are expected to be heavier over shorter periods. Most of the nation’s farmers are still engaged in mono-cropping and use chemical fertilizer in their production. “The chemicals break down the soil structure, so it gets sandy, it gets dry, so then when you get some rain and the rain is heavier, it just washes away the soil,” Herberg said, adding that this leads to flooding and landslides. “So, the way that we are farming, it is very dangerous for the future. If you look at the big picture of biodiversity, the planet’s biodiversity is what’s keeping the temperature [stable]. If you take away the biodiversity by making cities, chopping down the rainforest, whatever we decide to do to change the balance of nature, we cannot maintain a stable temperature,” she said. An important part of any discussion about adapting to climate change is the extent to which actions that have proven successful can be multiplied and scaled up. “I’m quite optimistic and I think that St. Vincent, as it is a small country, it is easy to get around. There is consensus that we need to be more sustainable and go organic and focus on renewable energy. And I actually think that it is going to happen: that we are going to get geothermal energy, improve our hydro stations and then more people will get on to solar. So we will be one of the first countries in the Caribbean that will be nearly everything on renewable energy within a very reasonable time – maybe 10 years,” Herberg predicted. She added that while Costa Rica is ahead of the region, St. Vincent and the Grenadines is a good example in the 15-member Caribbean Community of what can be done to adapt to and mitigate against climate change. “We are not ahead in organic agriculture yet,” she said, but added that there are “some outstanding examples”.